Many of you know that I work at a coffee shop, right? Well, on my day off, I turned traitor and got my caffeine fix at the notorious Starbucks. What can I say? I'm a sucker for a macchiato, no matter where it's made. Albeit, I don't like their hot drinks anymore. For some reason, their espresso shots taste burnt to me. But if you get it iced, it's not so bad. My tastebuds are now adjusted to Moxie Java's espresso apparently! Haha, I've mentioned to my co-workers before, and apparently they get the same burnt taste that I do. Anyway, for some photos, I decided to use my brand-stamped cup as a prop for some photos. This is what I wore last week for a day of thrifting with Corina. It's not often I wear pink, but while getting dressed, I instinctively started dressing in black and white (my work's dress code). I stopped myself. Halt! What was I doing!? Today was my day off. I had to wear some color. My eyes scanned the drawer, passing over the typical denim shorts I always reach for. Instead, they landed on these watermelon pink pair. The rest of this outfit came together easily, especially since I'd recently picked up this little scarf at the thrift store a couple weeks ago. It really added that special touch this simple outfit needed! So Corina and I set out in the 97 degree heat and wandered through aisles, found a few pieces of clothing, and then went to Hastings to pick out a few books. Now that there's a little more time in my days, I've been diving back into books and am so happy to return to my bookworm habits. I tore through The Fault In Our Stars recently, and man, did that rend my heart a bit. I was even reading it at work, in between the dead moments when there was nothing to do. It probably didn't help that I read it through 2 AM just to finish it, but I was crying on and off for about the last 50 pages. "I just don't understand your choice in entertainment! You read books that make you cry, and you watch movies that scare you..." Caleb looked at me sideways, one eyebrow cocked in disbelief. All I can say is, I know I'm not alone in this! Love the color of your shorts Linda! Looks so crisp against that white. I don't drink coffee much, but your and your friends are definitely coffee connoisseurs! :D I didn't read that book, because I knew it would make me cry. 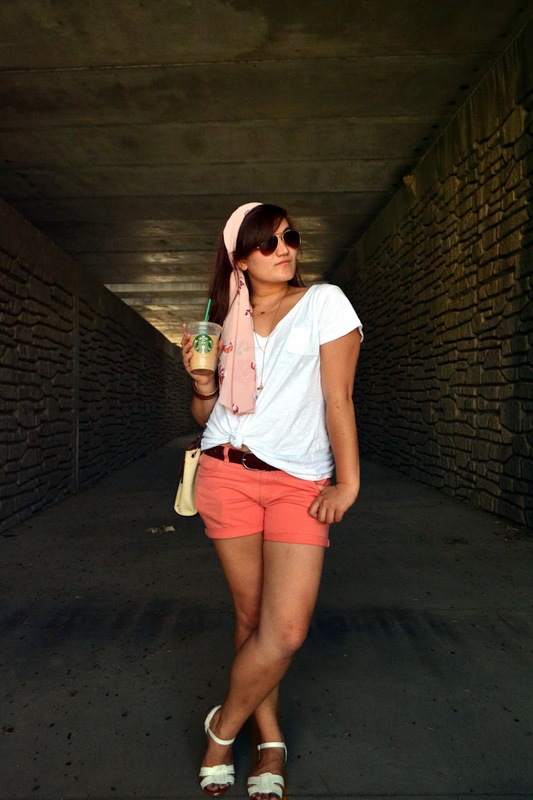 I love the scarf and the color of your shorts! you look great as always! Love these colors together and um, yes Fault in Our Stars is the saddest book ever. I loved it so much that I went and saw the movie and cried all over again. It's a fun form of misery! I actually haven't read that book yet. I'm sort of anti-popular stuff. Yay for more free time--I'm so feeling you there for once and it's amazing being able to churn through a book in a few days opposed to a few weeks, right?! i adore this!! the scarf is so pretty!!! :D you are blushing in pink, dear!! You look lovely in pink my dear. It's just a pleasing color, the headscarf is super cute too! I love this look. The colour pink suits you! I especially love the head scarf and the sandals. lovely outfit. I adore the floral print on your scarf. I definitely know what you mean, I sometimes have to force myself to wear color too. I always instantly reach for my black pants and any dark colored t shirt. haha love this post linda! and amazing outfit as always! Love Starbucks!!! Black and white is not my dress code for work but you've probably noticed I've been using it a lot lately. I seem to go through phases. I don't have a lot of time to read just lately but I like these type of books but I'm not with you on the scary movies, prefer a bit of romance myself hahaha. i LOVE this simple, laid-back yet super cute and summer appropriate outfit! i really like how your scarf matched your denim shorts!! i'm really glad your summer is going well! I really like how pink looks on you! I think it's a little unexpected, which makes it even cuter. And hey, Starbucks is so convenient that I'm a little embarrassed at how much I drink it. Don't tell anyone. I mean, there's really just no such thing as a bad time to get coffee, no matter where it's from, right? So happy to see that you've been having such a fun summer! This is so cute, love all the pink! Funny how you've become a coffee snob, haha. Same thing happened to me when I became more aware of local coffee shops. Love the head scarf! 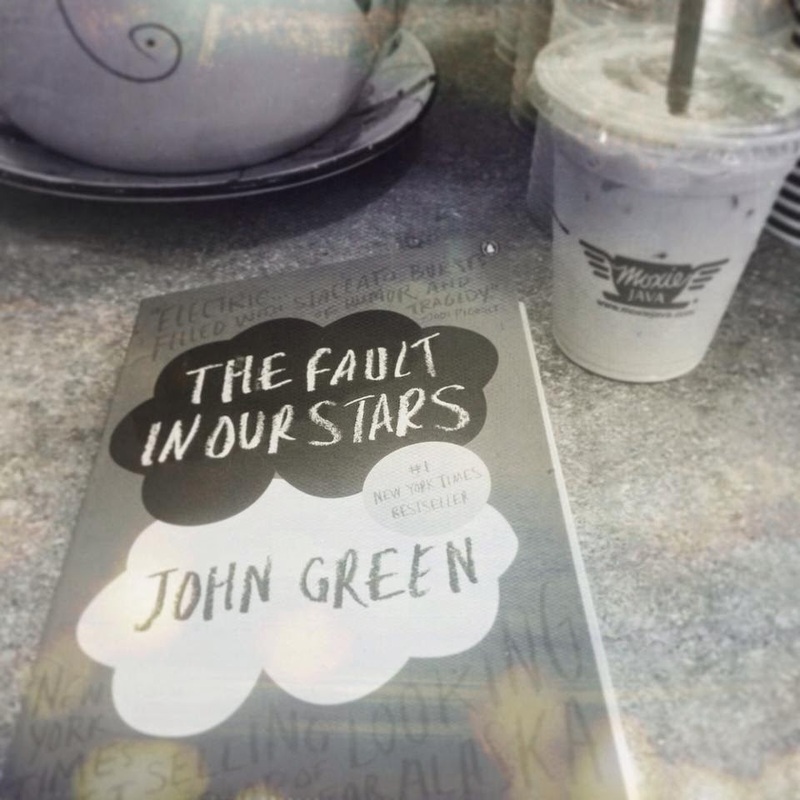 I'm reading The Fault In Our Stars at the mo, can't wait till I finish it so I can see the film! You look so cute and the outfit is adorable. I also love Starbucks! 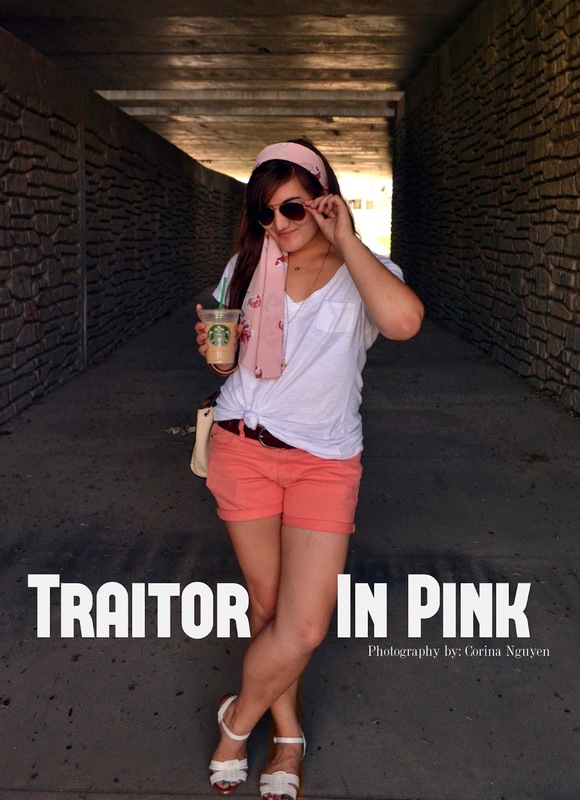 Not a traitor at all ;) Love these adorable pink shorts, its my favorite colour. I really need to find time to read this book. Thanks so much for your kind visit. Have a wonderful warm weekend! Love how you wore your shirt!